Sitamau is located on Southwestern plateau of Malwa between 23º 48’’ and 24º 14’’ North latitude and 75º 17’’ and 75º 36’’ East longitude. It is situated 1700 feet above the mean sea level. The area of Sitamau was 350 square miles. Its boundaries touched former Indore and Gwalior States in North, Jhalawar in East, Gwalior in West and Dewas in South-West. At time of its establishment, the area of Sitamau State was almost equal to Ratlam State. In this State (Sitamau), the parganas (former administrative unit) of Nahargarh and Titrod were also included. After some time Mughal Emperor Farrukhsiyar gave Aalot pargana too as Jagir (territory) to Keshavdas. But after Keshavdas, during the reign of his successor ruler GajSinh, the pargana of Aalot and during the reign of Raja FatehSinh, the pargana of Nahargarh were taken over by Panwars of Dewas and Scindias respectively and thus the limits of the State became comparatively constricted. If we look at the earlier eastern boundary of Sitamau State then this State touched the boundaries of five other States. To the north of this State was that part of Jawra State which is presently terme Malhargarh tehsil, at North-East was Garoth district of Holkar State, which is presently the Garoth tehsil, at South were Jawra and Dewas Senior States, at East the Jhalawar State of Rajputana and at West Mandsaur district of Gwalior State. At present, Garoth and Malhargarh tehsils lie to its north, at south is Ratlam district, at east is Suwasra tehsil and Jhalawar district (Rajasthan) while at west is Mandsaur tehsil. In the second half of 15th century, a Meena Sardar (chieftain) called Sata established a settlement on the hillock here, which later was known as Sitamau after the Meena chieftain Sata. For about a century, Meenas ruled the settlement. After sone time, a group of Gajmalot Rathours from Loutra in Idar State, led by Jujhar Sinh came towards Malwa and settled at Kheda near Sitamau. After Jujhar Sinh, Dhauji, Udaykaran and Nagji led this group. In 1549 AD, Nagji killed Meena Chieftains Lala Tora and Kanha and took control of Sitamau. During reign of Mughal Emperor Akbar, subas (administrative unit) were created as part of administrative reforms. Then Sitamau as part of Malwa Suba was included under Titrod Mahal of Mandsaur Government. Maheshdas, son of Dalpat – the fourth son of `Mota Raja’ Udai Sinh (Jodhpur), was Mansabdar (imperial officer) of Mughal Emperor Shahjehan. Shahjehan gifted Jalour pargana to Maheshdas in 1642 as jagir. Ratan Sinh was the successor of Maheshdas. As the income from Jalour pargana was poor, Shahjehan gifted Ratlam pargana to Ratan Sinh. Ram Sinh succeeded Ratan Sinh and Shiv Sinh succeeded Ram Sinh. As Ram Sinh died without any progeny, his stepbrother Keshavdas became the ruler of Ratlam after his death. As result of excesses owing to the fundamentalist policies of Aurangzeb, officials of Keshavdas killed Mughal officer Amin-e-Jazia Nasiruddin in 1694. Following this, Aurangzeb confiscated Ratlam pargana. On August 18, 1694 AD, the relatives of Keshavdas left Ratlam. They spent the year 1695 in difficulty in various places and then decided to stay in Sitamau and consequently settled there on January 14, 1696 AD. Keshavdas was in south at that time and still continued to sincerely serve the Emperor. In 1696 AD, the fortunes of Keshavdas changed again and his mansab was increased to `panch sadi jaat do sau sawar’. At that time he had received some villages of Dhar pargana as per the mansab and also the pargana of Nahargarh as jagir. Even after receiving Nahargarh, Keshavdas kept his family at Sitamau . On September 3, 1696 AD, on recommendation of ManSinh Rathour, two hundred more horsemen were added to the mansab of Keshavdas, but no final decision was taken on villages given for it, because at that time some lackadaisical attitude had seeped into the royal administration. Keshavdas received the villages around Sitamau as jagir only in January 1699 AD. In 1699 AD itself, the mansab of Keshavdas was further increased by `ek sadi jaat aur ek sau sawar’. Maharajkumar Dr Raghubir Sinh has written that `during last 50 years, the contemporary importance of Sitamau had increased’. But still, the center of pargana was known as Titrod pargana. Then Keshavdas started making efforts to get Titrod pargana. He became successful on October 31, 1701 and Aurangazeb handed over the Titrod pargana to him. Keshavdas then made Sitamau as center of his jagir instead of Titrod and in this way, a new Rathore State of Sitamau was established in Malwa. Keshavdas passed away in New Delhi while being in royal service. The elder son of Keshavdas, Bakhat Sinh had died without leaving any progeny during the life of Keshavdas. Then the younger son of Keshavdas, Gaj Sinh, became the ruler of Sitamau. Gaj Sinh ruled for about 18 years and when he passed away in 1752 AD, his son Fateh Sinh became the ruler of Sitamau. During the reign of Fateh Sinh, the terror of Marathas had increased in Sitamau and this forced Fateh Sinh to set up his emergency-time capital at Laduna – 3 km south of Sitamau. Fateh Sinh got coin minted in his name in 1787 and these coins remained in circulation in Sitamau for 100 years. Fateh Sinh passed away at Laduna Garh in 1802 AD. Upon his death, his elder son Raj Sinh became the ruler of Sitamau. During the initial years of reign of Raj Sinh, the menace of Marathas had further increased. It was because of this that in year 1820 AD, by the intervention of Sir John Malcolm, decision was taken to pay yearly tax of Rs 60000 to the Scindias under the British domain. Following this, the rule of Raj Sinh over Sitamau was finally accepted and as peace returned to Sitamau, Raj Sinh shifted his capital back to Sitamau from Laduna. In 1867 AD, Raja Raj Sinh passed away. Raj Sinh had two sons – Ratan Sinh and Abhay Sinh. Abhay Sinh had passed away at the age of 20 years. Maharajkumar Ratan Sinh was born on April 11, 1808. He was a prince with many talents. Along with academics, he was also interested in hunting. He had knowledge of Urdu, Hindi, Braj, Sanskrit, Dingal and other languages. Seeking inspiration from his father Raja Raj Sinh and teacher Guru Swarupdas, he had started penning poetry in various languages under the pen-name `Natnagar’. He also wrote books titled `Natnagar Vinod’ and `Diwan-e-Usshak’ and also collected volumes of poetry. He was also interested in music and instrumental art apart from horse riding. He also wrote ‘Ashwa Vichar’ giving description of special characteristics and temprament of horses. Sitamau saw several ups and downs during the reign of Raja Raj Sinh. But after peace prevailed, he got a lot of construction work done in Sitamau and Laduna Garh. Along side; his relatives and the subjects of Sitamau also undertook a lot of construction work. Sitamau could not remain unaffected by the flame of revolt that spread around Malwa. Historian Dr Raghuvir Sinh held that Sitamau didn’t fall on any national highway or even a regional route but the subjects were happy with the ruler Raja Raj Sinh (1802-1867) and the prince Rajkumar Ratan Sinh ‘Natnagar’, which is illustrated by the fact that the state remained peaceful and the rebellion had no direct effect on the internal affairs of the princely state. A band of rebel horsemen from Mahidpur reached Sitamau on June 12, 1857. They were intent on rioting. This led to panic among the residents. Raja Raj Sinh was not in a position to forcefully take on the rebels and gave away Rs 28,000 to them to leave the state without any disturbance. Raj Sinh though saved the state from trouble but the British officials got the information, which is apparent from Wazir Beg’s letter that expresses anger over why there was no attempt to fight with the rebels. Due to Raja Raj Sinh’s policy, Sitamau escaped the plundering but due to the situation in Mandsaur and Neemuch, the situation remained fluid here also. Urban area was predominantly Muslim and it was apprehended that the state’s security personnel that chiefly comprised of Pathan, Arab, Afghan, Rohilla, Vilayati and Makrani soldiers could get aroused in the name of jihad and join the rebel forces. Militarily and financially, Sitamau was not in a too strong situation. Raja Raj Sinh was caught in a difficult situation. On one hand, the rebel forces were putting pressure on him to extend help while he was consistently also receiving orders of the British offiers to crush the rebels. Raj Sinh’s predicament has been described aptly in Mirza Wazir Beg’s letters. In the letters he writes, that the state army was not big enough to take on the attackers and had they decided to fight, the rebels may have taken over the city. In another letter he writes that the ruler is caught between the devil and deep sea. Accepting Mandsaur’s will is extremely difficult and if we don’t go by the British officials, our fate may be sealed. The situation took a serious turn when Mughal prince Firoz Shah returned after the Haj pilgrimage from Mecca and reached Malwa by July 1857. He was born out of the wedlock of Nizam Bakht, the grandson of Shah Alam II and Abadi Begum, the granddaughter of Alamgir II. When he arrived in Malwa, he had little resources but local Muslims gave him ample respect. Upon reaching Khachrod, he gave a call for jihad and though Baqar Husain forced him to leave, Firoz Shah grew stronger after that. He took refuge at Pharnaji temple and hundreds of Muslims gathered around him. His supporters kept growing fast. Soon he was leading a large number of Muslim soldiers and supporters. He marched towards Mandsaur. The soldiers serving under the Scindia’s army, particularly, Rat Makrani, Vilayati and Arabs rebelled and joined Firoz Shah. Enthused Muslim populace made him sit on the throne on August 11, 1857. He took up the title of Humayun Shah and sent directives to the neighbouring states like Pratapgarh, Sailana, Ratlam, Jaora and Sitamau to help him with funds, arms and resources. As this news spread, thousands of Mewati, Vilayati and Makrani soldiers quit their respective armies and joined his forces. By September 1857, he was leading a strong army of over 18,000 soldiers. This further complicated the situation for Raj Sinh. Wazir Beg told Raj Sinh to act with caution with regard to Mandsaur. ‘We should clearly express to Mandsaur that if Ratlam, Jaora and Salana are ready, we too should be counted among them’, he wrote in the letter. When British officers got the news about prince Firoz Shah’s growing strength, they got alarmed. Major Timmins who had been seeking refuge after he had fled from Mahidpur, reached Sitamau. Timmins was taken to Sitamau’s old trouble-torn capital Laduna for stay. With full security, Timmins was escorted to Neemuch but as the situation wasn’t favourable, he was later sent to Mahidpur. The Mughal prince had deployed his close confidantes and the informants were keeping an eye on the neighbouring states. He got information about Major Timmins. But Firoz Shah said that his aim was not to terrorise the princely states, rather the enemy were the British. He said that the princely states and the feudal lords would be asked for help in fighting the British. He sent a 2,000-strong army led by Kedar Rao and Rahim Bakhsh to Sitamau to get funds. Raj Sinh had already got the letter in which he was asked to send Rs 1.25 lakh cash, ten horses, an elephant and soldiers apart from the tax else the state would be ravaged. Soon the army reached the outskirts of Sitamau. Raj Sinh wrote a letter to Jaora Nawab informing him that the army from Mandsaur had reached Bilantri near Sitamau. Sitamau’s prince Ratan Sinh ‘Natnagar’ was in Jaora then and said that in such a delicate situation, everybody should unite. He asked Jaora Nawab to send gunpowder and urged him to pay attention towards the changing situation. Nawab soon sent his soldiers along with cannons and gunpowder to Sitamau. Meanwhile, Hulas Rai, the kamdar of Sitamau, also sent an application to Nawab, informing him about the rebel army. Rai wrote that the villages of Sitamau are in vicinity of Mandsaur and the local army is not strong enough to take on attackers. Besides, the financial condition wasn’t well and no money-lender is willing to provide a substantial amount, even Baba Apte has been communicated through letters to send army but there has been no response. Rai further wrote to the Nawab to take back the soliders. “We have kept the gunpowder with us which is enough for now. However, there is a huge scarcity of grains”. The Jaora Nawab subsequently allowed grain to be taken to Sitamau. In the meanwhile, Bhopal Sinh reached Mandsaur with his army but was overpowered by Firoz Shah’s forces. Bhopal Sinh submitted a hundi of Rs 8,000 to the Mughal prince. In a letter Wazir Beg has written that Raja Sahab had given money to rebels. At other places, another account by Badshah Girha mentions that a contingent of Rajput fighters was sent to Firoz Shah and Rs 28,000 was also sent with them. From Wazir Beg’s letters, Raja Raj Sinh kept getting information about the activities of the British forces as well as the rebel bands. On one hand, the financial support was extended to the rebel soldiers in order to save the state from their attacks. While on the other hand, when it was felt that the British were emerging stronger and the balance of power was shifting to their side again, it was decided to extend support to them to save the state. During Raja Raj Sinh’s reign, there was also development in the field of literature. He was patron and shelter provider to poets and laureates and there are references of him giving them jagirs. Maharajkumar Ratan Sinh passed away on January 26, 1864 after developing complications following an unfortunate fall from a horse. Then Ratan Sinh’s son Bhavani Sinh became the ruler of Sitamau on June 19, 1867. During reign of Bhavani Sinh, on June 26, 1867, the British Government accepted Sitamau as an independent State and gave the title of `His highness’ to the ruler and bestowed the honour of 11-gun salute. Bhavani Sinh passed away on May 28, 1885 without leaving behind a son. Thus, the elder son of a close relative (Chikla Thakur Takhat Sinh) – Bahadur Sinh was adopted and made the ruler of Sitamau. But he too died without leaving a son and so his younger brother Shardul Sinh was made the ruler. During the rule of Shardul Sinh, Sitamau faced drought and epidemic and Shardul Sinh died because of this epidemic on May 10, 1900. Raja Shardul Sinh also died without a progeny and thus the State once again faced the problem of inheritance. In this situation, a solution to the problem was found by the British Government and Ram Sinh – the second son of Maharaj Dalel Sinh of Kachchi Badoda, who was a descendent of Rai Sinh, the second son of Ratan Sinh who had played an important role in the battle of Dharmat - was made the ruler of Sitamau. During the reign of Raja Ram Sinh, Sitamau saw all round development. It was a golden period for the Sitamau State. He brought about lot of administrative reforms soon after ascending the throne. He knew the importance of education right from the beginning and thus made several efforts for development of education. At that time a middle school existed in Sitamau. A branch of this school was opened in Laduna city in 1907. In 1920, Shri Ram High School was established in Sitamau city. A board constituted by the Raja governed the school. The board had three state-appointed and three non-government members. The Diwan of the State was the chairman of the board. In the year 1935-36, a Sanskrit School was also established. A Saraskunwar Girls School was established to educate girls. Apart from Sitamau city, full attention was paid to rural education too. During 1939-40, schools were opened in many villages. A committee was constituted to decide upon the syllabus of rural education. Maharajkumar Raghubir Sinh was made the chairman of this committee. The syllabus finalized by the committee was implemented in 1940. Schools were opened in Laduna, Deepakheda, Dalawada, Khejaria, Titrod, Eira, Chikla, Manpura, Sakhtali, Khajuri and others villages. Along with this, to provide residential facility to the Rajput students during their education, a Raghubir Rajput Boarding House was established in 1933 after the name of Maharajkumar Raghubir Sinh. Thus, Raja RamSinh took several steps for all round development of education. Raja Ram Sinh also made many efforts for progress of agriculture and increased production of farmers. He knew that to improve the poor economic conditions of the State, there is need to improve land-revenue. Good land-revenue could only depend on progressive agriculture. Thus Raja Ram Sinh gave plots of such arable agriculture lands to the farmers that were till then lying unused. The farmers were also provided financial assistance from the State for digging wells so that irrigation facilities became available. 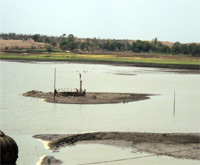 As a result, 44 new wells were dug and 250 bigha of additional land became irrigable. Alongside, Raja Ram Sing also made proper arrangements to ensure that none of the royal employees did any excess or behaved badly with the farmers while recovering loan from the farmers. He always took care that there was no injustice meted to the farmers. He established veterinary hospitals to ensure cattle health, set up agriculture farm to train the farmers in advanced forms of agriculture and also invited outside agriculture experts to give innovative trainings to the farmers. There was protected forest area within limits of Sitamau known as Radi and this land was reserved for growing grass and for hunting by the royal family. The people in the surrounding areas did illegal felling in this forest and thus Raj Ram Sinh set up the `Forest Department’ in 1909 for protecting the forest resources. This forest department had one officer, one assistant to him, one clerk and five jawans for protection of the forest. These employees had strict instructions to protect the forest area. A municipality was functioning in Sitamau State since 1895. Right since establishment it included persons appointed by the Raja. Till the reign of Raja Ram Sinh, this system was prevalent and the Diwan of the State was the chief of the committee. The subjects had no direct say in the system and thus it was difficult for the people to get their problems solved here. To solve this problem, Raja Ram Sinh, increased the number of members of municipality to 21 to give proper representation to people. Eight out of these 21 were State-appointed officials and employees while other 13 were people’s representatives. The tenure of these members was three years. In this way, Raja Ram Sinh made special provisions for solving problems of people and undertaking proper development of city by giving direct representation to people. Raja Ram Sinh paid attention to trading reforms apart from the other reforms. During that time, the traders of the State had to pay separate cess for weighing of vehicle and to the agents owing to contract system. Raja Ram Sinh took steps for uniformity of taxes by scrapping double taxation and by increasing tax on some of the commodities. The responsibility was given Sayar Department and in 1917, a regulation was passed to uniform the tax rates. The fake coins being minted in the State were banned. A trading unit was established in 1926 at the cost of Rs 13800. Looking at the dearth of small coins in the State, paper coins worth one anna to four annas were issued in 1943. Raja Ram Sinh was a justice-loving ruler who always worked for welfare of subjects. The stories of his love for justice can still be heard from elderly people. During the first four years after his ascendancy to throne, Raja Ram Sinh did not get full rights related to justice from the British Government. He had to seek approval from the AGG for punishments in criminal cases like death sentence, life imprisonment or externment from State limits. He made a lot of efforts to do away with this lacuna and finally succeed. In April 1921. The British Government removed the restriction and gave judicial rights to the Raja. Raja Ram Sinh re-structured the judicial system after getting the full rights and gave the rights of sessions judge to the Diwan of the State. There were no fixed rules for the lawyers in the State earlier. They did not need to take authorization before they started practicing law. Raja Ram Sinh made it compulsory for the lawyers to get the authorization. The lawyers were also divided into two categories. The class I lawyer could practise at all courts in the State, while the class II lawyers could only appear in specific courtes (Peshi khas and Mehkama khas). Similarly, undertaking reforms in the police system, Raja Ram Sinh set up police posts within the Sitamau city and also one at the Laduna village. In 1912, mounted police were introduced in the State and were posted under the Resaldar. Of these, eight mounted police were always ready for action, while four others worked elsewhere. Right from beginning, Raja Ram Sinh had a welfare attitude. Thus he came up with a new ordinance to provide participation to his subject in local governance system. This ordinance of December 1938 came into effect in the State on July 1, 1939 by the name of `Sitamau Rajya Shasan Vidhan’. Raja Ram Sinh also established a State Legislature by name of Rajya Parishad under the Shasan Vidhan for providing participation to people in governance work. The Rajya Parishad had one chairman and 21 members. Of the members, 15 were from among subjects and six were appointed by ruling committee. Out of the 15 people’s representatives, four were from Sitamau city, one from Laduna village, five were from Khalsa villages, while other three elected by jagirdars of the State. Two other non-government members were nominated by the Raja. The then Yuvraj (Heir) Dr Raghubir Sinh was appointed as the first chairman under the new Shasan Vidhan. The tenure of the elected members of the Rajya Parishad was three years, but the Raja could increase or decrease this tenure in special circumstances. Also, rules for election of non-government members were formulated and published in February 1939. In this context, an executive committee was established to help the Raja in administrative work and named as `Shasan Samiti’. In Shasan Samiti too, six members were appointed by the ruler along with the chairman. Yuvraj Dr Raghubir Sinh was made the chairman of the Shasan Samiti too. Diwan Motilal Awasia was made vice-president, Jaswant Banthia was appointed Nayab Diwan, LalSinh Naulakha was made Finance member, Shivramakrishna Godbole was made revenue member, Nandkishore Vyas was made member and Komal Sinh Mehta was made secretary. The Shasan Samiti met twice every week. In this way Raja Ram Sinh showed a very progressive attitude and did a lot of work for the welfare of the people looking at the demand of time. Along with bringing about administrative reforms, Raja Ram Sinh also undertook several construction works in Sitamau and surrounding areas. He constructed Kishan Mahal within the fortress in Sitamau city and also a Laxmi-Narain temple in the campus. Raja Ram Sinh also constructed the present residences of the royal family. He also constructed palatial houses in Koteshwar and Bhagor. Raja Ram Sinh ruled in Sitamau till the State merged into Indian Union. He passed away on May 25, 1967. Shri Natnagar Shodh-Samsthan is situated on Raghubir Sinh Marg in the Sitamau city. Sitamau is 30 km. away from Mandsaur District. The Samsthan has an easy approach by Road and Rail. The nearest Railway Stations are Suwasara, Shamgarh and Mandsaur. Road transport buses run frequently from Suwasara, Shamgarh and Mandsaur to SITAMAU. Nearest Airports are Udaipur & Indore. Udaipur to Sitamau - 230 Km. Indore to Sitamau - 254 Km.